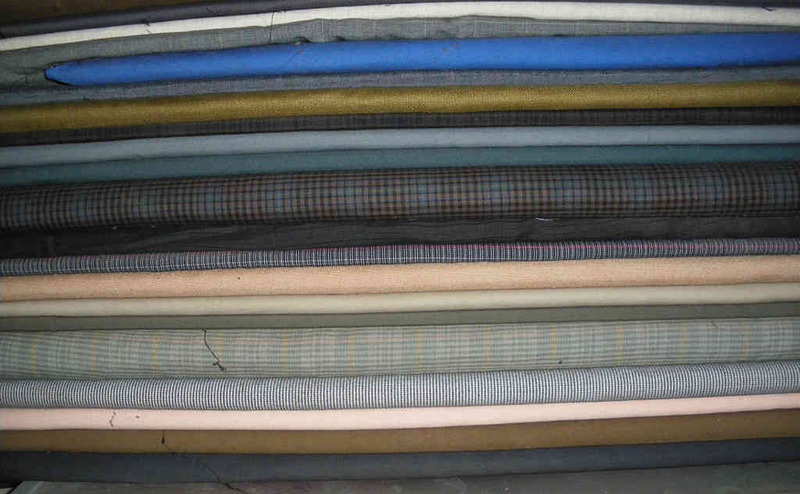 Recently my old friend Peter Argy was talked into retiring by his wife and family and while clearing out his shop, I made a deal with him for all of his left over fabric. Had a guy bring it round to my place on his ute (pickup truck in the US) and I was left with this mountain of partial rolls and folded pieces of a very wide range of fabrics. Some suiting in pure wool, linens, cottons, wool/terylene mixes, some silk and while it was parked all over the house, I have just about got in order. Still have to find a reliable place to put it all. I also got about 30 or so cones of different colours and fortunately I had a spare draw that it all fitted in. I have been tidying the rolls up, trimming the ends so they are square which also leaves me with some scrap to play with and test out. Sad to say some colours are out of the useful range for me, there is one large roll of slightly off white linen of very good quality that would make a nice mens coat but a colour like that would be fatal for me to wear. Will post a photo when I get more of it under control. I'd pay you on paypal to see you knock up and wear a nice pair of fuchsia stubbies. I don't know if I have the talent for wearing fuchsia coloured stubbies but I now have some OK suiting material that is dark enough but I will have to wait for next summer as its a bit cold for stubbies at the moment. The real problem is I am not sure I have the patterns for non-stretch any longer, of late I have been making 6 panel stubbies out of stretch drill. I would have to prototype a new pattern out of ordinary drill then tweak it for the difference in fabric weight. Super 100 is not really ideal for things you knock around but I think some of the darker stuff is heavier than that and would wear OK. Educate a yank here please, what are "stubbies'? Short pants perhaps? Its a funny story, they used to be referred to as "football" shorts but in the early 1970s a company called Fletcher Jones designed a production version as they were popular here in Australia because of the heat in summer. There had a problem as to what to call them and the story goes while deciding the product name at a local pub while drinking small bottles of beer called "Stubbies", they decided to name the shorts after the small bottles of beer. The base design is a 4 panel short leg pair of shorts with a single back pocket and a button down front pocket. Typical inner leg seam length was between 1.5 and 2 inches. Apart from ordinary slob wear, they were well suited for guys working on building sites in the heat and interstate truck drivers in the old trucks before they were all air conditioned. The company was sold in the late 1980s and production moved to Fiji and they no longer fitted, they were too wide and too short at the waistline and you could not safely wear them if you were a typical Aussie beanpole. I started making my own about 15 years ago because where I live in Sydney gets hot in the summer and it is one way to avoid getting cooked in the hot weather. Most Australian kids of my era wore stuff like that at school. Ha ha, most of the guys who wore them would be offended at being called gentlemen. The photo is what they typically looked like back in the late 60s and 70s. This is the caption for the photo below. A stubby is a beer; specifically a short-necked bottle of beer. A stubby holder is also known as a Koozie, beer sleeve, coldy holdy, and is the thing that keeps your beer cool and stops your hands from getting cold. The guy on the left hand side was typical of slob/work wear and they never made fashion here, just practical in the heat or casual barbecues. Here is a link that shows the history of the brand name Stubbies. LATER : Paul Hogan in stubbies meets the queen. He's a shameless bugger that Paul Hogan. Re: the schoolboy photo. That's also what I wore in England when I started school. Maybe the shorts were flannel. Here is some of the stuff I bought from Peter Argy. I don't know what to do with some of the colours but there is enough useful colours and fabric types to make a number of useful things. Thanks Hutch for the history of stubbies. Here in the US shorts were short, too. One reason why they got longer is to prevent cancer- melanoma. Wouldn't want to play basketball in these long shorts.